Definition at line 891 of file conmsg.h. Definition at line 902 of file conmsg.h. Definition at line 896 of file conmsg.h. Definition at line 903 of file conmsg.h. Definition at line 913 of file conmsg.h. Definition at line 977 of file conmsg.h. 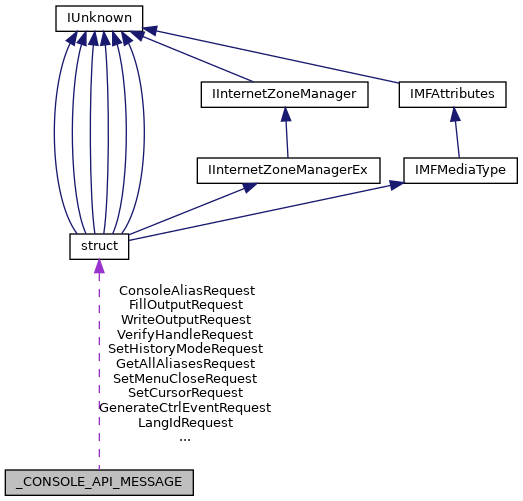 Referenced by IntAddConsoleAlias(), and IntGetConsoleAlias(). Definition at line 937 of file conmsg.h. Referenced by GetConsoleMode(), and SetConsoleMode(). Definition at line 927 of file conmsg.h. Definition at line 895 of file conmsg.h. Definition at line 922 of file conmsg.h. Referenced by GetConsoleCursorInfo(), and SetConsoleCursorInfo(). Referenced by CloseConsoleHandle(), ConsoleMenuControl(), CreateConsoleScreenBuffer(), DuplicateConsoleHandle(), FlushConsoleInputBuffer(), FreeConsole(), GenerateConsoleCtrlEvent(), GetConsoleCP(), GetConsoleCursorInfo(), GetConsoleDisplayMode(), GetConsoleFontInfo(), GetConsoleFontSize(), GetConsoleHandleInformation(), GetConsoleHardwareState(), GetConsoleMode(), GetConsoleOutputCP(), GetConsoleProcessList(), GetConsoleScreenBufferInfo(), GetConsoleSelectionInfo(), GetConsoleWindow(), GetCurrentConsoleFont(), GetLargestConsoleWindowSize(), GetNumberOfConsoleFonts(), GetNumberOfConsoleInputEvents(), GetNumberOfConsoleMouseButtons(), IntAddConsoleAlias(), IntAllocConsole(), IntAttachConsole(), IntExpungeConsoleCommandHistory(), IntFillConsoleOutputCode(), IntGetConsoleAlias(), IntGetConsoleAliases(), IntGetConsoleAliasesLength(), IntGetConsoleAliasExes(), IntGetConsoleAliasExesLength(), IntGetConsoleCommandHistory(), IntGetConsoleCommandHistoryLength(), IntGetConsoleInput(), IntGetConsoleKeyboardLayoutName(), IntGetConsoleTitle(), IntReadConsole(), IntReadConsoleOutput(), IntReadConsoleOutputCode(), IntScrollConsoleScreenBuffer(), IntSetConsoleNumberOfCommands(), IntSetConsoleTitle(), IntWriteConsole(), IntWriteConsoleInput(), IntWriteConsoleOutput(), IntWriteConsoleOutputCode(), InvalidateConsoleDIBits(), OpenConsoleW(), RegisterConsoleVDM(), SetConsoleActiveScreenBuffer(), SetConsoleCommandHistoryMode(), SetConsoleCP(), SetConsoleCursor(), SetConsoleCursorInfo(), SetConsoleCursorPosition(), SetConsoleDisplayMode(), SetConsoleFont(), SetConsoleHandleInformation(), SetConsoleHardwareState(), SetConsoleIcon(), SetConsoleMenuClose(), SetConsoleMode(), SetConsoleOutputCP(), SetConsolePalette(), SetConsoleScreenBufferSize(), SetConsoleTextAttribute(), SetConsoleWindowInfo(), SetLastConsoleEventActive(), ShowConsoleCursor(), and VerifyConsoleIoHandle(). Definition at line 915 of file conmsg.h. Definition at line 986 of file conmsg.h. Definition at line 973 of file conmsg.h. Definition at line 934 of file conmsg.h. Definition at line 904 of file conmsg.h. Definition at line 908 of file conmsg.h. Definition at line 981 of file conmsg.h. Definition at line 980 of file conmsg.h. Definition at line 979 of file conmsg.h. Definition at line 978 of file conmsg.h. Definition at line 985 of file conmsg.h. Definition at line 984 of file conmsg.h. Definition at line 992 of file conmsg.h. Definition at line 946 of file conmsg.h. Definition at line 938 of file conmsg.h. Definition at line 944 of file conmsg.h. Definition at line 945 of file conmsg.h. Definition at line 916 of file conmsg.h. Definition at line 962 of file conmsg.h. Definition at line 994 of file conmsg.h. Definition at line 953 of file conmsg.h. Definition at line 924 of file conmsg.h. Definition at line 943 of file conmsg.h. Definition at line 965 of file conmsg.h. Definition at line 907 of file conmsg.h. Definition at line 933 of file conmsg.h. Definition at line 957 of file conmsg.h. Definition at line 940 of file conmsg.h. Definition at line 893 of file conmsg.h. Definition at line 987 of file conmsg.h. Definition at line 950 of file conmsg.h. Definition at line 954 of file conmsg.h. Definition at line 909 of file conmsg.h. Definition at line 912 of file conmsg.h. Definition at line 961 of file conmsg.h. Definition at line 964 of file conmsg.h. Definition at line 963 of file conmsg.h. Definition at line 997 of file conmsg.h. Definition at line 898 of file conmsg.h. Definition at line 929 of file conmsg.h. Definition at line 931 of file conmsg.h. Definition at line 993 of file conmsg.h. Referenced by SetConsoleCP(), and SetConsoleOutputCP(). Definition at line 923 of file conmsg.h. Definition at line 921 of file conmsg.h. Definition at line 939 of file conmsg.h. Definition at line 947 of file conmsg.h. Definition at line 917 of file conmsg.h. Definition at line 989 of file conmsg.h. Definition at line 988 of file conmsg.h. Definition at line 958 of file conmsg.h. Definition at line 955 of file conmsg.h. Definition at line 951 of file conmsg.h. Definition at line 928 of file conmsg.h. Definition at line 930 of file conmsg.h. Definition at line 974 of file conmsg.h. Definition at line 956 of file conmsg.h. Definition at line 920 of file conmsg.h. Definition at line 897 of file conmsg.h. Definition at line 952 of file conmsg.h. Definition at line 914 of file conmsg.h. Definition at line 968 of file conmsg.h. Definition at line 969 of file conmsg.h. Definition at line 971 of file conmsg.h. Definition at line 970 of file conmsg.h.